Happy Mani Monday everyone! 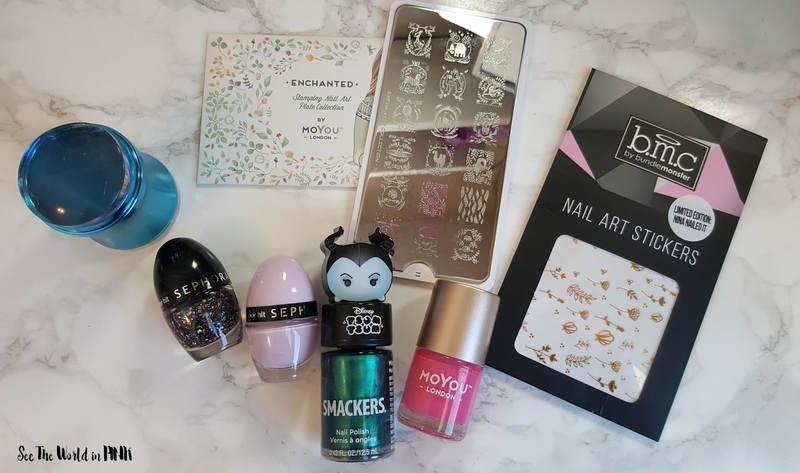 I was so excited to see Sephora Collection nail polishes pop up recently as ever since Formula X was discontinued, I was waiting for another "house" brand pop up for affordable polishes there! 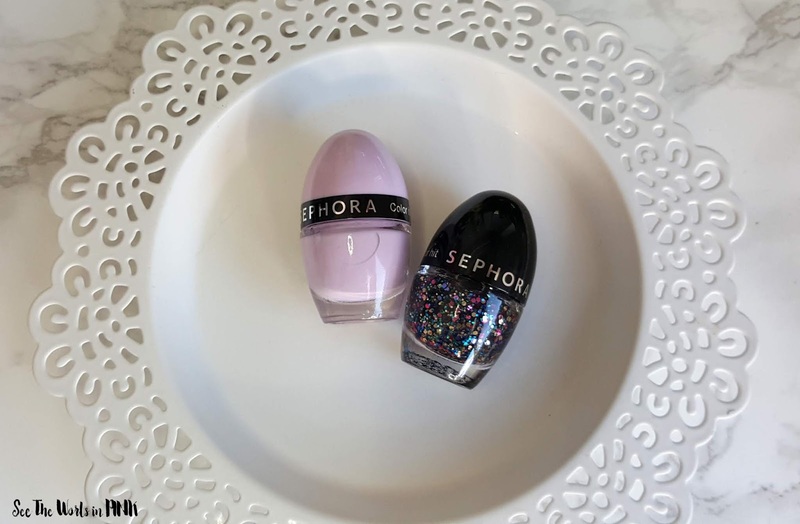 The Sephora Collection Color Hit Mini Nail Polishes are fairly new to Sephora and come with a decent shade selection of creme finishes, and a few shimmers and glitters. What I failed to realize until after I ordered 2 of these polishes is that they only come in this little mini polish size, which I think is a little strange. (I realize now that the word mini is in the name; but, I don't always pay full attention!) They are only $6.00 CAN each making them super affordable. I used Lilac Fantasy as the base for all of nails and I just love it! You can also see Firework with to coats on my ring finger and thumb. 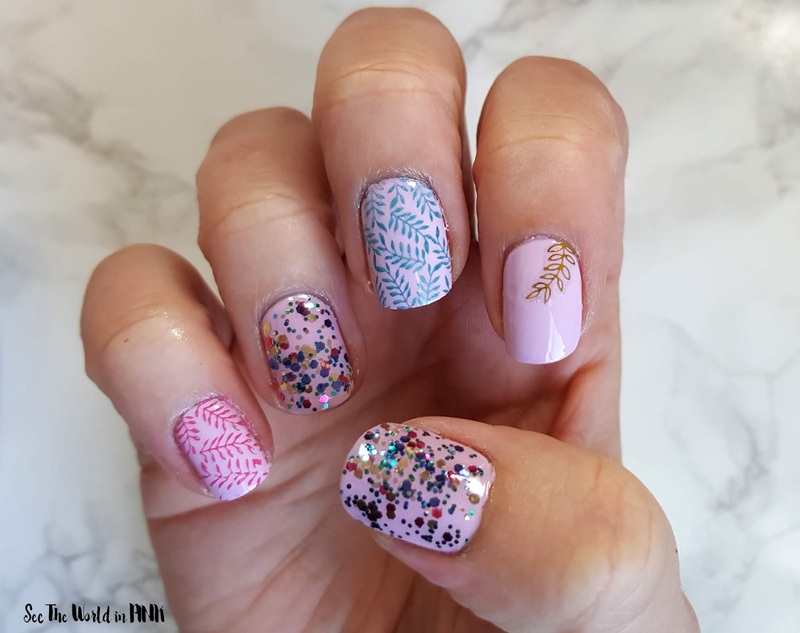 Also, for this week's Mani Monday we chose the theme "Leaves" as a final good-bye to Fall before winter and Christmas fully take over our nail looks! 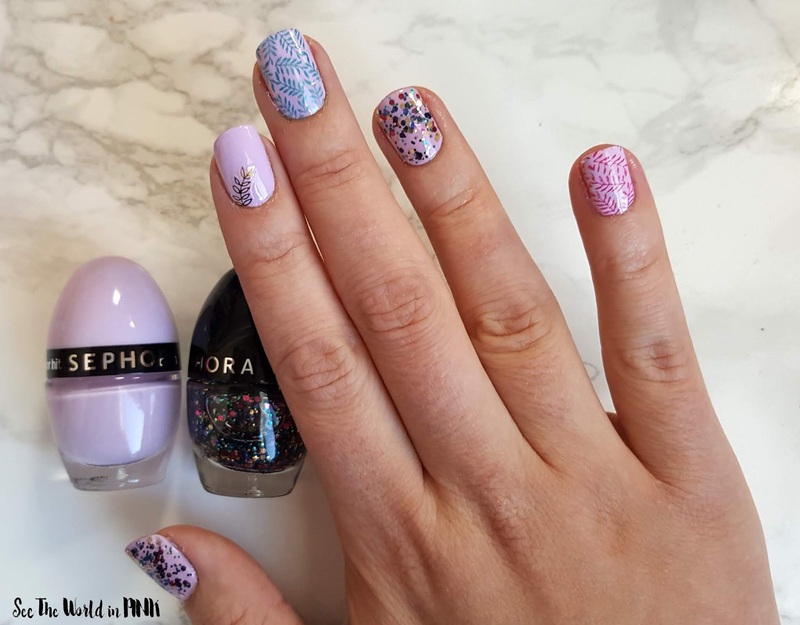 My look ended up looking very Spring and I'm just fine with that - I couldn't wait any longer to try these Sephora polishes! -MoYou London polish in Pink! For this mani I started with Formula X nail cleanser and base coat, then I applied 2 coats of Lilac Fantasy for the base. Then I applied 2 coats of Firework to my ringer finger and thumb! Then, I wanted to play on some matching glitter in Firework for the leaves. Using the Enchanted 11 plate, I stuck to an all leaves section and applied the same leave in green and pink to my middle finger and thumb. Then with the gold stickers, I found similar leaves and applied just a little accent to my pointer finger. I know it's not very Fall Leaves theme; but, I love how all the colours work out together! 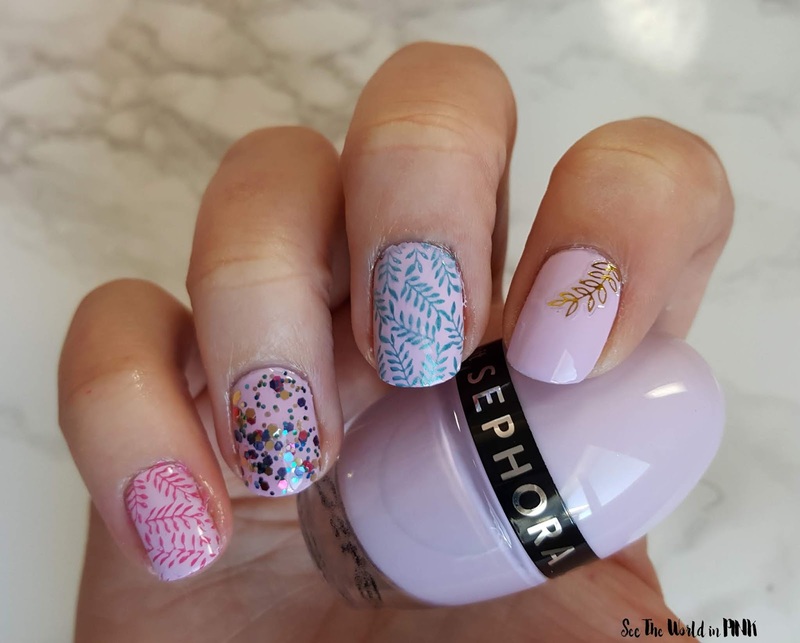 Make sure you check out Cosmetic Proof, Prairie Beauty Love, and Tea & Nail Polish to see their take on "Leaves" for their manis this week! Thanks! It is cute, little packaging! 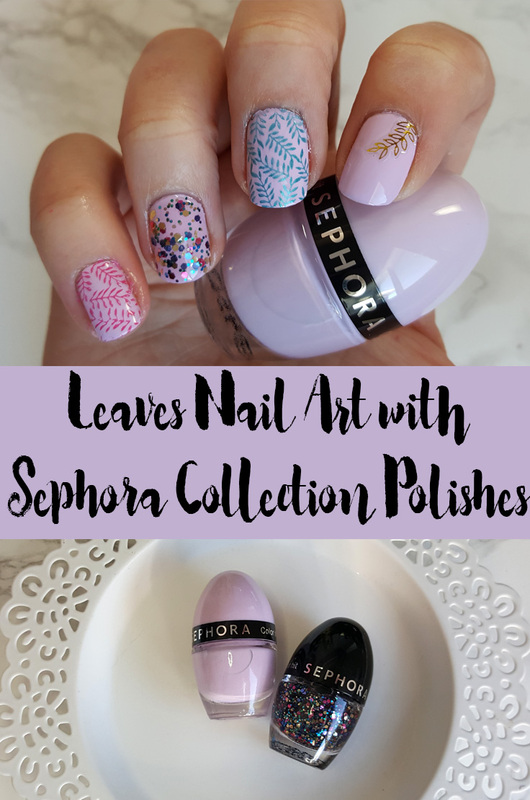 Yes, they usually do not have good brushes and there is nothing work than a tiny nail polish brush! This one worked well! Those look so cute! You're to talented - I can never do my own nails! This is such cute nail art. That Sephora pink is so perfect on you, I love its shade. I may have to get it. Thank you! I'm loving this shade too - it's a good little polish! Fireworks is pretty, I bet it would be beautiful over a red! Oooh - I bet it would be! Might have to try that combo out! Gorgeous nail art!! You're so talented!